bebop spoken here: And the Oscar goes to...jazz! 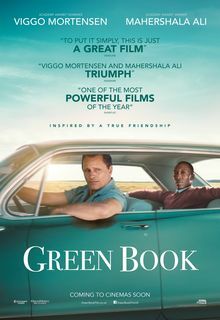 The Best Motion Picture at this year's Academy Awards is Green Book. The film soundtrack was composed by Kris Bowers the 2011 winner of the Thelonious Monk International Jazz Piano Competition. Check out the reviews - they are all over the mass media - then make a date at your favourite movie theatre. A worthy winner, can't wait to see it. My son saw it yesterday(he lives in USA) and praised it. Yes, indeed - I'll definitely be seeing it, sometime - it's had wonderful reviews, and sounds like a truly inspiring story.